The first aspect you should know about this device is the fact that it’s a dual fuel model that runs on both gas or propane straight out of the box. With a propane hose included in the package, you’ll be able to use it right after purchasing it without any trouble. Moreover, the model also includes a patented fuel selector switch that allows the user to quickly and safely switch from one fuel source to the other. When it runs on gasoline, the generator can produce 4750 starting watts and then 3800 running watts, while these numbers are 4275 starting watts and 3420 running watts when running on propane. Given its capacity and the fact that you can use it to power quite a large number of appliances in case you need to, the unit is considered by some users to be rather heavy and loud. In terms of the sound level it produces, you might want to know that it operates at 68 dBA from 23 ft. If you think this number is too high for your needs, you might need to look at other alternatives as well. However, do keep in mind that this is similar to having background music or conversations in a restaurant, so it’s not really that much. Many features make this a very good addition to your RV, for example, but one of them is the running time. Given the up to 9 hours run time on a full tank of gas and the average of 10.5 hours when running on a 20 lb. propane tank, you can rest assured that you don’t need to face any emergency situation in terms of your appliances anytime soon. Besides being a convenient solution, this is also a cost-effective one, especially during those times when you are dealing with a longer power outage in your area. By using this device, you’ll be able to power the essential items around the house for longer periods while having enough time to look for solutions. 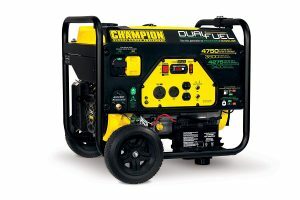 The generator is powered by a 224cc Champion engine you can rely on and that features a Touch Start, a push-button electric start that definitely comes in handy. 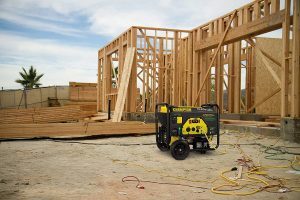 Given that the unit needs to be ready to run at any given point, the device also includes an internal battery that charges the battery as the generator is in use. As you can only imagine, this device does need to run in safe conditions and the manufacturer is more than aware of this aspect, given that it included in the design many features that make this unit a safe one, besides the fact that it’s portable and convenient. The generator includes the Volt Guard, which is a built-in surge protector that keeps your appliances safe from spikes in voltage that go above a safe threshold. Furthermore, since varying temperatures can also be an issue, the Cold Start technology comes in handy as it optimizes the generator to easily start in cold weather. This way there is little left to worry about.